In a highly competitive global business environment, it is vital that companies improve business processes to control costs and improve efficiency. One method that more companies are considering is revising traditional, paper-based payments and instead choosing an online payment provider that can accommodate low-cost, flexible digital payments solutions. A payments study from the Federal Reserve Board¹ found that the number of paper checks in the US declined by 50 percent from 2000 to 2012, and that number continues to drop². More and more, companies are realizing checks are expensive, inefficient, slow, and vulnerable to errors and to fraud. Large businesses, however, have embraced digital payments for years now. Checks are still a part of their offerings, but customers, employees, and partners frequently choose to receive their funds in more efficient methods. To accommodate the diverse, large-scale payment needs of corporations and the need for smaller organizations to transition from paper checks, there has also been an increase in funds disbursement platforms and payment providers. Some out-of-the-box solutions offer all the functions required for a smaller business to move to digital payments – however, as companies increase in size and complexity, the volume and variation of disbursements will change as well. Large corporations and small and medium businesses have fundamentally different requirements from payment providers. To determine the right provider for your business size, follow these four steps. Small companies have fewer disbursements recipients, with fewer variations in payment type. A small business makes payments to a limited number of employees, vendors, and customers. There are very few variations in the type of payments made to each category. With limited recipients, an out-of-the-box payment solution can easily meet small and medium business payment needs. Large companies have a larger number groups they must pay and greater diversity within each group, so they often require a platform that can support greater complexity. A large business may require an online payment provider that can support not only ACH payments to employees and vendors, but also gift cards for employee and customer incentive programs, corporate purchase cards for travel expenses, payroll cards for unbanked employees and contractors, and virtual payment accounts for vendors. 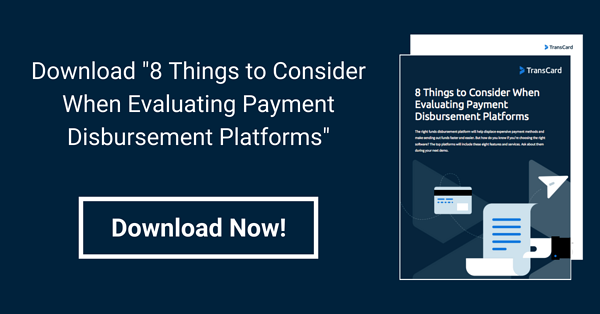 Understanding the actual volume of disbursements your organization makes is vital in deciding which payments provider will make the best partner. Companies can use monthly volume to get a good idea of how significant disbursements are for your organization, as well as the type of electronic disbursements that will be required. A small company with disbursement volumes in the thousands, or tens of thousands would be served with a simple solution that meets business requirements. A large company, with monthly disbursements in the millions, may be better served by a dedicated solution that can handle high volumes without creating extra work for staff. Automation tools, attachments, and other features from custom funds disbursement solutions could all improve payment processes for large enterprises. Different types of businesses have varying complexity in payment processes, types, and recipients. For example, in a large company, disbursements of a certain type or value may require multi-party sign-off or levels of approval, and more frequent ‘exception’ payments, which cannot be served by a standard process. A custom solution is better suited to higher levels of complexity, as found in a made-to-order managed solution. Corporations in various industries may also have different needs. Legal disbursements follow different procedures than insurance disbursements, for instance. If you’re in a complex business in a highly regulated field, you’ll need to look for more advanced payment providers who can customize solutions to your needs. An evaluation of current disbursement processes is closely aligned with the volume and complexity of payments that are made by the company. A small company, with low levels of complexity, will have fewer unique, specialized processes. However, if you find that current processes are multi-step, with a high variation in process, type and exception, a more complex platform may be required to support them. Look for a platform that simplifies your payment processes. For medium-sized companies, online payment solutions that offer a variety of features and payment methods without additional expense are often a good choice. Large companies that need a platform to fit their processes will want to look for a larger payment provider who can tailor solutions to their needs. In general, companies that are smaller in size have a lower volume of disbursements, with simple processes, fewer exceptions, and less complexity. An organization of this type can find excellent functionality with a standardized, out-of-the-box solution meeting all business needs. Companies in highly regulated industries, with larger, more complex processes and types of disbursements may benefit from exploring options with a full-service partner. Full-service partners create custom solutions or tailor existing platforms to meet unique organizational needs.